Fallout 4 brings a new mechanic into play: we can build real settlements in the game and be an active part of rebuilding the Commonwealth and restoring humanity to its greatness. Or at least try. However, settlements prove to be, usually, extremely time consuming and most people still don’t know how the whole thing works. 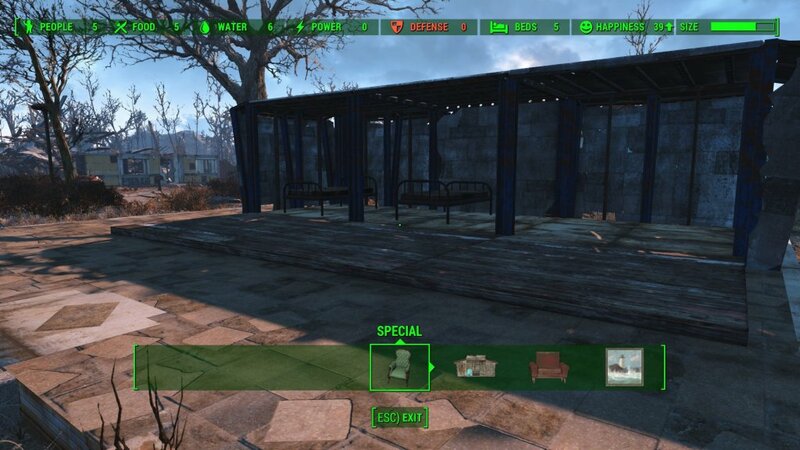 I’ve spent countless hours exploring this part of the game and I am here to share with you my findings in a complete Fallout 4 settlements guide, filled with tips, tricks and advice to building the perfect settlement in the game. The truth is that they can prove extremely useful in the long run and they’re quite fun, adding a whole new experience to the game. So let’s check out below my own guide to settlement building in Fallout 4, and maybe you’ll agree that it’s a lot easier than it first seems to be! You can build settlements if there is a workshop around. 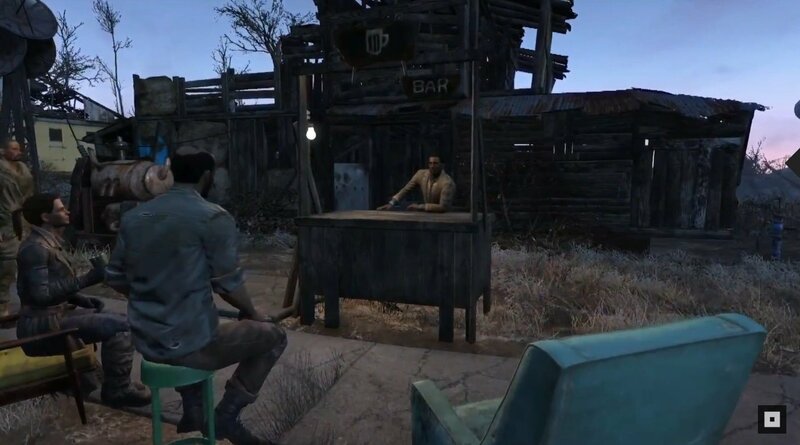 Simply press and hold the V key and you’ll enter the settlement menu. Before building, you should do one important and usually time consuming thing: scrap everything around you. Tires, mail boxes, fallen trees, fallen fences and structures, destroyed houses… you should scrap everything you can find for building materials. You will get more and more of them as you play the game (they will be collected in your inventory as “junk” and they are all extremely valuable as they all become building materials). So make sure you clean up the area first – if you want to, you can simply scrap everything, including existing chairs and appliances. EVERYTHING to start over fresh. Building Materials Tip: Spend some time when completing a major area in the game (like the auto factory, for example) and collect everything you have there. 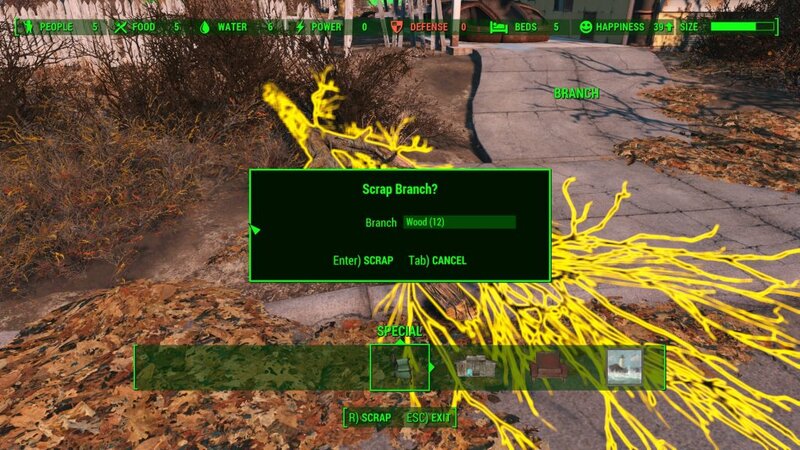 You will usually find a ton of junk that you can bring back to your settlement. Fast travel a few times (you can also fill up your companion with junk!) and scrap everything to have all the materials you need. The same can be done with weapons for scrapping, but only after you get the required skill. However, this is another story and we’ll talk about this later. – Size – how large a settlement can grow. Your settlers don’t need varied foods or luxury items to be happy. Just provide them with food (gather raw fruits like Watermelons, Carrots and everything else), water and beds and they will be happy. Remember that you will be able to harvest the food planted by your settlers, so they are extremely useful in this area. The most important part about settlement building is defending it. First of, make sure that you give all your settlers some sort of weapon, otherwise they’ll run or go fist fighting against invading raiders, and that’s not something you’d want them to do. But arming the settlers is not as important as building defenses. There are various defensive structures that you can build in Fallout 4, but I would honestly focus on turrets as they are extremely useful as taking down enemies, so these should be your main focus. When building defensive structures, note the areas where enemies will attack from. They will usually follow the main road, so defend that well. Place a watch tower and assign a well armed settler to guard it, then add the turrets and you should be all set. There are other things you can build, but there honestly is no need to do so. Save the power and especially the copper which is needed to bring electricity to everything around your settlement. Don’t forget to scrap everything! In order for things to work (like people defending the watch towers or farming), you need to assign roles to your settlers. In order to do so, interact with them as you do with your companions (pressing the E key for PC users) and send them to the desired location – which is either the farming area or the watch tower. Try to have no more than two settlers defending, though as it is extremely risky for their lives. First of all, make sure that you keep your settlement’s happiness level as high as possible. You do this by having extra water, food and beds, as well as providing good defense value. When you are here, you need to build a Settlement Recruitment Tower and new people will arrive. It’s simple like that! Now that you know everything about this, you can build the perfect settlement(s). Take your time to build everything as nicely as possible – scrap everything around, keep collecting junk and bring it back for extra materials and decide between actually going for building a nice city (spend time to create real houses) or just a place where people will live (no need for walls, doors, just basic stuff). Either way will work. Make sure that you are always producing enough food, water and electricity and pay attention to your defenses: you need your settlers to be well armed and you need the turrets placed in the best positions to take out enemies. Try to have two turrets nearby so one protects the other and take advantage of the terrain and structures you can build in order to direct the invaders where you want them to be. For example, the flame thrower is extremely useful if you are talking about close quarters, so use fences to create a hallway-like structure and place the flame thrower at the end. Visit your settlements often and care for them – they can help you a lot in the game and they offer a new level of accomplishment when you see that you are helping rebuild civilization.